$19,700 plus NAV and Leather package takes it to even $22,000 Our test model had a $19,760 base price tag that also included as standard equipment maple wood tone trim, six way adjustable seat, power door locks with auto locking, push button starter, leather steering wheel with illuminated audio controls, as well as cruise control with illuminated controls. Safety equipment included the usual air bags along with electronic brake force distribution, "smart" automatic headlights with LED accents and taillights, heated power outside mirrors with LED turn signals built into them, and fog lights. Full disclosure - my first new car was a Nissan Sentra back in 1984. I loved that car. With 5% of the amenities of its' 2013 sister version, it cost one-third as much; a testimony to the value of today's model. With all that is in this vehicle, the performance and reactive handling are the areas that are lack-luster, at best. I appreciate the crowded class the Sentra plays in, and still, relatively speaking, it lacks power and acceleration. With four cylinders and 130 horsepower, it doesn't offer much zip, especially in our very hilly city and rolling terrain. The 1.8 liter four cylinders, 130 horsepower engine is really overtaxed at times, and to make matters worse, the engine is a little noisy-more so than I've noticed on other compacts competing with Sentra. 39 highway /30 city Good, but not great. I noticed instantly that the highway mileage is only 1 mile per gallon less at 39 than the bigger Altima rated at 38 miles per gallon for its four cylinder engine, so the Sentra's highway mileage figures won't seem too impressive to four cylinder Altima owners. In the Sentra's case, it's the city mileage-34 miles per gallon-that's going to move it off showroom floors fast. That's especially likely when people find out they can save $3850 over five years compared to most cars in gasoline costs. Annual fuel cost is $1,550 based on $3.55 per gallon gas and 15,000 miles of driving yearly. Great size and back seat room. Roomy trunk, also. The Sentra gets plus points for its infotainment system, Bluetooth for hand-free driving, adjustability in driver's seat for optimized visibility and steering wheel flexibility. 60/40 Spilt fold-down rear seats offer packing plus. The new Sentra is quite a nice compact car--nice enough, in fact, that we suspect it will give buyers of midsized cars reason not to buy their products. Hope that doesn't affect Altima too much, because we have a very high opinion of Sentra's bigger sibling. We found out quite quickly about the new Sentra as soon as we got behind the wheel of a Sentra SL, the top of the line model. For $22,400, you get a beautifully turned out car with leather appointed heated front seats (price we quoted includes options like the leather seats), full power accessories, antilock brakes, a really convenient tire pressure monitoring system, and lots of other things that can't even be had on most compact cars. Another calling card for the all-new Sentra includes being one of the roomiest cars on the market. There were 42.5 inches up front and 37.4 inches in the rear. That's genuine stretch out room and we can think of plenty intermediate sedans that don't have that kind of space. This makes Sentra, which is about two inches longer and about 150 pounds lighter than last year's model. the car to beat if you want something clearly smaller than an intermediate sedan but with comparable interior space. When it comes to on the road driving, the Sentra does pretty well, and it certainly rides nicely, one of the most comfortable compacts around except when pavement surfaces are uneven. But the Sentra struggles to keep up when it comes to hills and situations requiring a lightning fast response. Driver and passenger airbags, ABS system, VDC to maximize control, Tire Pressure Monitoring, The National Highway Traffic Safety Administration rates the safety on this vehicle between a 4 and 5 star. Safety equipment included the usual air bags along with electronic brake force distribution, "smart" automatic headlights with LED accents and taillights, heated power outside mirrors with LED turn signals built into them, and fog lights. A modest jam session can be had with the 6 speaker sound system. The NAV works well and is visible with 4.3" color display; 5.8" display in our upgraded model. Voice recognition very exceptional in this entry level model. Heated exterior mirrors are wonderful for city dwellers who park curbside. Push button. See prior sections about the equipment included. 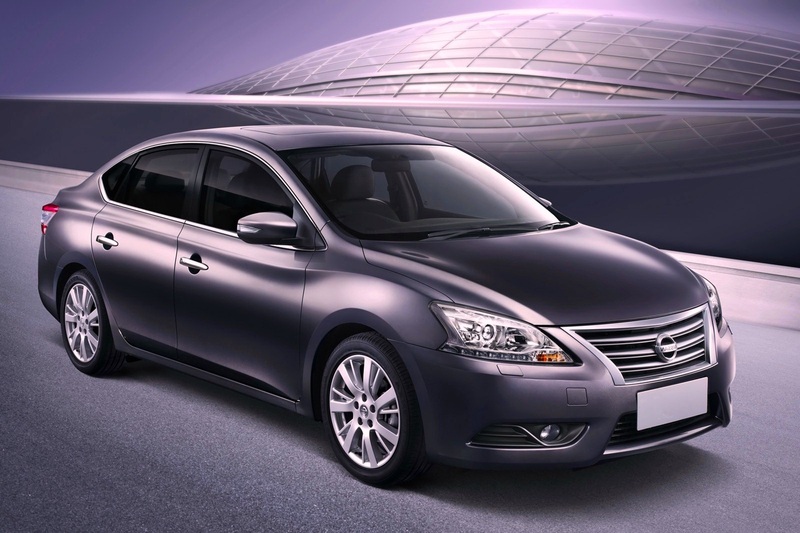 2013 Sentra comes with a three-year/36,000-mile limited warranty and a five-year/60,000-mile power train warranty. 2013 Sentra has a three-year/36,000-mile limited warranty and a five-year/60,000-mile power train warranty.